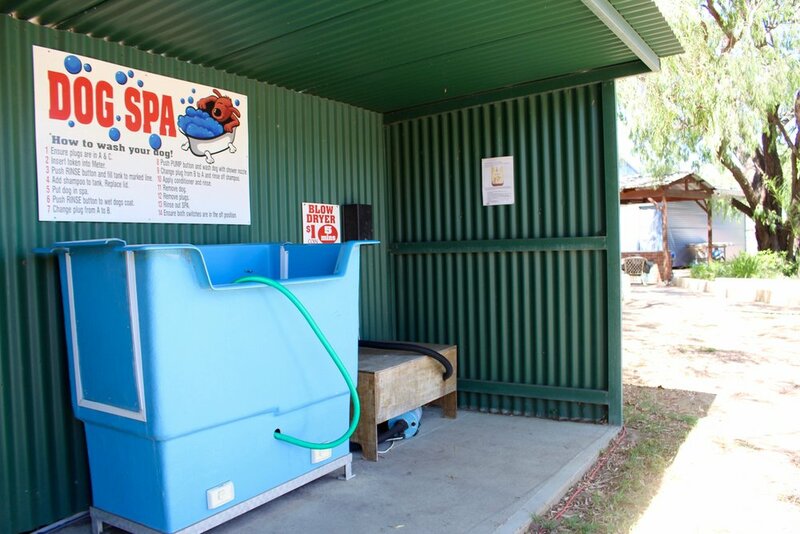 Four Seasons Holiday Park is one of the largest Busselton Accommodation locations and is set on 22 acres of land among the shade of old peppermint trees, with large, open-grassed areas - an extremely peaceful setting for getting away from it all. The relaxing, tranquil atmosphere has been described by many as a country hideaway in a beachside setting. Even your best friend is welcome! Located only 200 metres from the serene shores of Geographe Bay, Four Seasons Holiday Park is the perfect base from which to explore the entire region. With some of the country’s best surf breaks within easy reach and the finest Margaret River Wine Region’s wineries nearby, you’ll be set for the perfect family holiday! Four Seasons Holiday Park has been operating for over 40 years, making us one of the longest established caravan parks in the business. We are winners of the Tidy Park Award and the Eco Tourism Award for Recycling. The park is set on 22 acres of land, the relaxing, tranquil atmosphere has been described by many as a country hideaway in a beach side setting. We are situated only 200 metres from the beautiful Geographe Bay beach with it’s pristine water and soft white sand; an ideal beach for the family. to check on availability and prices for your stay! Our accommodation consists of cottages, on-site vans, powered and non-powered camping sites – we have something to suit everyone’s needs and budget. Enjoy an evening of possum searching with the kids as you wander through the park by torchlight, or watch the wild birds feeding during the day. At the beach, you may be lucky enough to spot a dolphin or even a whale during the whale season. We are centrally located to all the attractions of the South West region of Western Australia, including the superb wineries, art and craft galleries, restaurants, local cheese and chocolate’s, and the fabulous coastline with world class beaches and walking trails as far as the eye can see! Fully self-containedrustic beachside cottages for the whole family. Space! Bring your boat or family and friends, there is ample room front and back of each of our cottages to park your boat and a few cars with room left over! There is also good distance between cottages and there are well treed areas giving you room to play and greater privacy. Call today to check on availability and prices for your stay! Our fully self contained beach-side rustic cottages are complete with 3 bedrooms, sleeping 6 to 8 people. They are the perfect getaway for families or small groups, whether it’s for a weekend, a week or even a whole month. Each cottage has one bedroom with a double bed, one room with 2 single beds and one room with either 2 single beds or 2 sets of bunks, depending on weather it sleeps 6 or 8 people. All cottages have a spacious living area with a table, chairs and television. The kitchens in the cottages are well appointed with fullsize fridge, electric hotplate, microwave, crockery & cutlery, kettle, toaster and electric fry pan. They are all fitted with reverse cycle air-conditioning. Remember, we take the utmost pride in the cleanliness of our facilities. All of our cottages, except our "Dog Friendly" cottages, have the linen provided. For our "Dog Friendly" cottages you will need to bring all your own linen with you for your stay. Fully equipped on-site caravans with an annexe and extra living space. Our On-Site Caravans can accommodate 2 to 6 people and all are equipped with an annexe to provide extra living space and shade during the summer. Perfect for those who will want to spend most of the time out surfing, fishing, hiking and generally exploring the amazing South West. An On-Site Caravan is a great way to have a cost effective escape right across the road from the beautiful Geographe Bay beach. They are set amongst the beautifully treed area of the park that provide ample shade during the warm summer months. As with the Cottages, the On-Site Caravans all have a stove, fridge, kettle, toaster, microwave, crockery and cutlery as standard. So all you need to bring is your own bedding and towels, or we can arrange to have these provided for you. 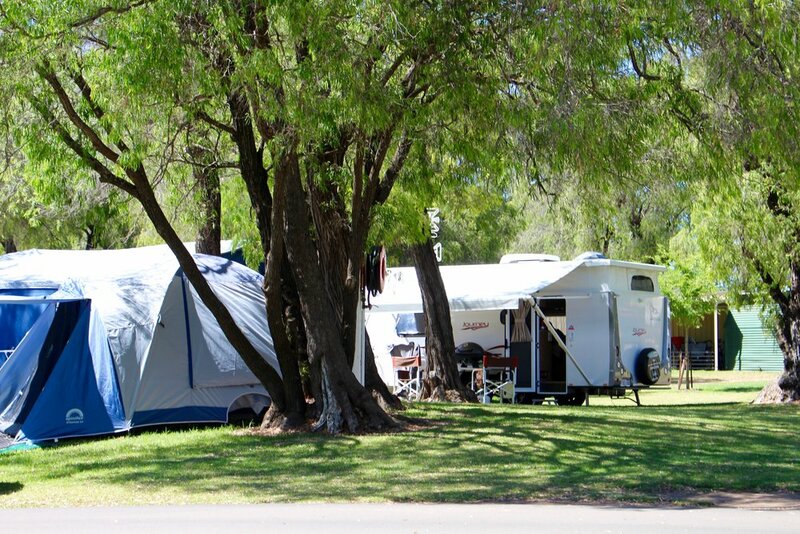 Powered and unpowered camping sites close to amenities and luandry facilities. 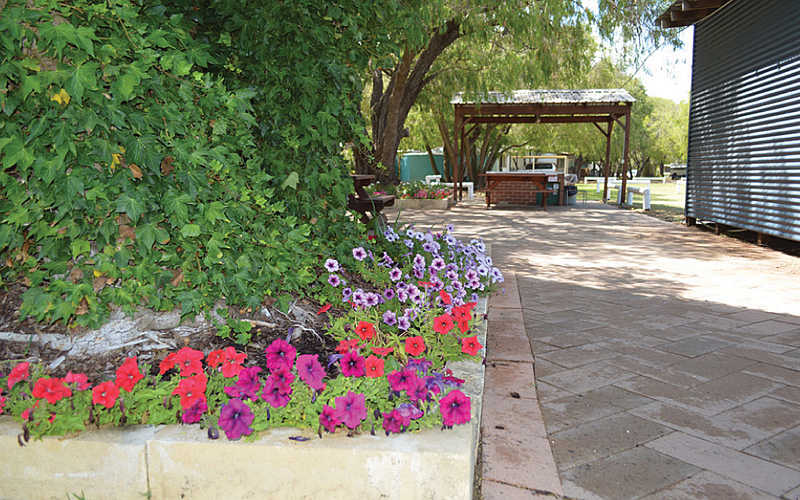 Powered and Unpowered camping sites available throughout the holiday park, close to amenities and laundry facilities. Approximately 50 powered sites are scattered around the park, all in grassed and shady locations with plenty of room for everyone. The benefit of being such an established park is that we have plenty of perennial trees that cast ample shade over your site. All sites are close to our amenities, complete with baby bath, laundry, washing machines and dryers. Clotheslines are also situated in the park close to the laundry facilities. Approximately 50 non-powered sites are also available for those who enjoy camping under the stars in a safe, beautiful environment. 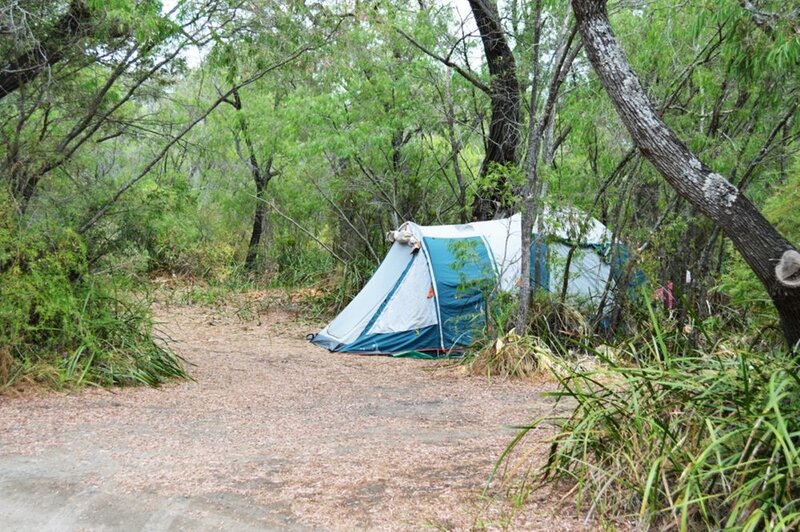 Most sites are grassed or in bush setting, which lends itself to the real camping experience. For those who enjoy the more rugged camp out, we have the ultimate sites. We have two BBQ areas and a Campers Kitchen. We also have dog friendly facilities for your best friend. We understand how hard it is to leave your pet when you come on holidays. So we've created just the right environment for you to bring your best friend along too. Of course a few rules apply, to make sure everyone enjoys their stay at Four Seasons Holiday Park. Following these simple rules will make for a great holiday, but failing to follow them may result in the cancellation of your accommodation with refund. Please look after your dog by keeping them on their lead at all times. Your dog will always be happier when you are with them, so please don't leave them unattended! Dog's always prefer to stay outside, so please don't take them into any of the buildings, unless it is one of our dog friendly cottages! When a dog has to go, he has to go! We provide plenty of doo-doo bags for you to clean up after them! Management reserves the right to disallow any dog. Take your best friend for a walk along the beach and treat them to a deluxe doggie spa! Tokens for a small fee are available from the office and shampoo and conditioner are all provided as part of the service! Bring the kids, dad, even the dog! DIY Dog Spa right on site! Enjoy all the local attractions of Busselton and Dunsborough. 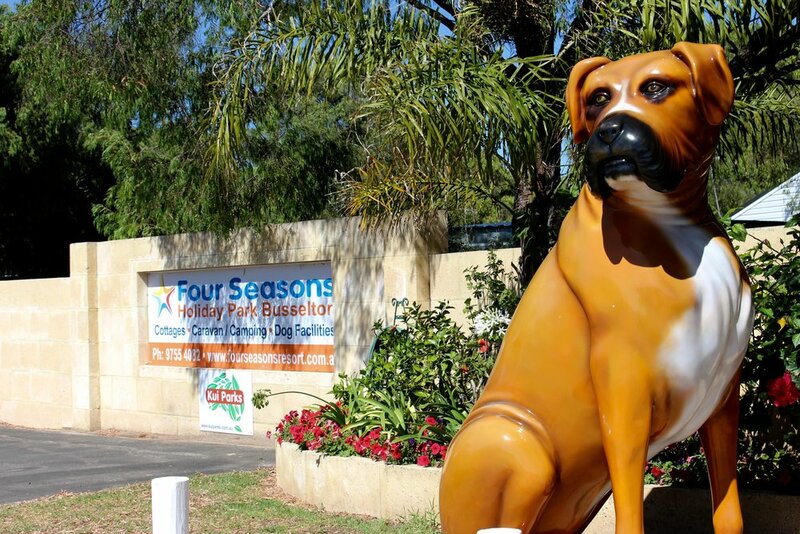 Four Seasons Holiday Park is perfectly situated, making it easy for you to enjoy all that the region has to offer. Breathtaking beaches, stunning surf breaks, world renowned wineries and magnificent coastlines combine together into the perfect holiday experience. Busselton has twice been judged WA's Top Tourism Town, and it's not hard to see why. Not only is it considered the state's premier seaside resort, with the pristine Geographe Bay amongst its features, it is also the gateway to the region's wine making capital, Margaret River. But, as you will discover, the attractions of Busselton encompass so much more! Dunsborough, like Busselton, has also been judged WA's Top Tourism Town. A favourite 'down south' family holiday destination, Dunsborough is a short scenic drive away, nestled on the edge of Geographe Bay, it is situated only minutes from local wineries and restaurants. Even though there are so many to choose from, we've managed to shortlist the following places and thoroughly recommend you visit at least a couple while you are here. Come for a visitcontact us todayand stay for a while! Please fill in your details and enquiry here, and we'll respond within 24 hours. For more immediate enquiries and to talk to a real person, please call the number below. We've received your enquiry and we will be in touch soon. See Terms & Conditions of Booking. Fours Seasons Holiday Park – gateway to the South West, so easy to find! Only 15 minutes south of Busselton, only two and a half hours south of Perth.